The June 24 day school in Britain on the radicalization in Latin America was an important political event. 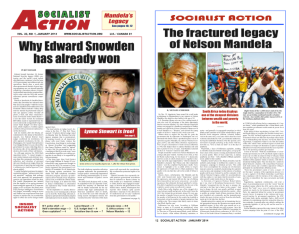 It was organized by Socialist Resistance, a united-front newspaper that includes Socialist Action’s cothinkers of the International Socialist Group, the British section of the Fourth International. The school was well attended and the panel of speakers was impressive. A prominent participant was Celia Hart, a Cuban publicist, who is the daughter of two of the most respected leaders of the Cuban Revolution, Armando Hart and Haydee Santamaria. She has become known in the international left for her embracing Trotsky’s theory of permanent revolution and her argument that the Cuban Revolution and its survival are a testimony to the validity of the theory. According to Lister, Hart then continued, “ALBA can be a clear example of what can be done, underlining the fact that it is impossible to offer such benefits to the people under governments that hang on to the capitalist framework and neoliberal agenda. Jorge Martin spoke at the school on behalf of the campaign to oppose U.S. intervention against the Chavez government in Venezuela, the Hands Off Venezuela (HOV) committees. He stressed that HOV was a united front open to all who defended the democratic rights of the Venezuelan people. Two speakers came from the Fourth International—Michel Lowy, a professor who is an expert on the liberation theology movement, and Edouardo Diago from the French Ligue Communiste Revolutionnaire. July 24, 2006 in International.